Nothing says "Let's get down to business!" 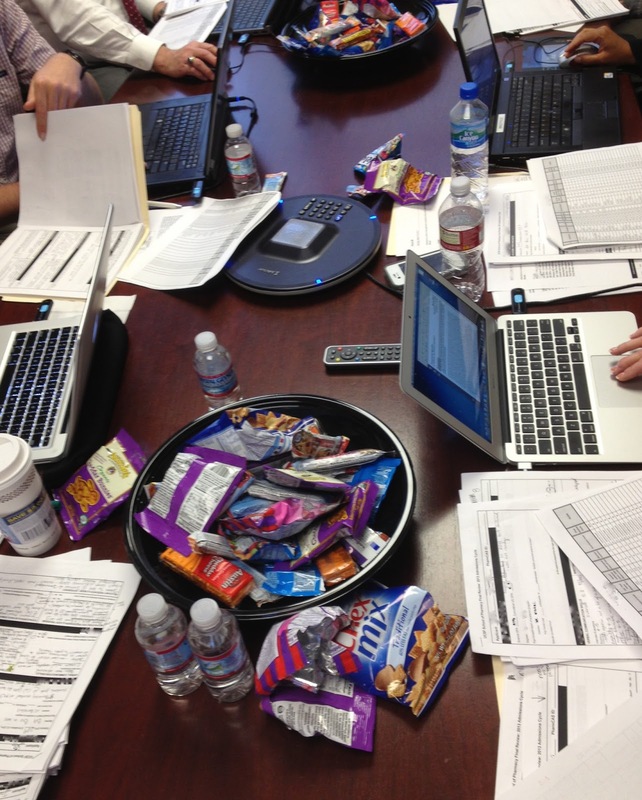 like bowls full of snacks, laptops full of applicant files, and a whole LOT of information! It feels good to be right on track... and so close to the end. If it helps, we will be more than happy to send more snacks your way. Patience is definitely not what's lacking on our side, it is the suspense that's keeping us on our toes :). Mmm circus cookies...reminds me of childhood (and interview day). I am wondering what that circle device thing is in the center there. Thanks to you guys, for putting so much effort into the admissions process. The circus cookies are always the first to be snapped up. In fact, I'm surprised an unopened bag is still in the snack bowl. The circle device on the table is an awesome new contraption that we use to input an applicant's name and PharmCAS#. The device then magically tells us whether that person will be admitted to UCSF or not. Just kidding... the circular device is the tele/video-conference machine -- in case someone needs to call into the meeting from a remote location. I agree! During my interview I went for the animal cookies!! Every time my phone makes any type of sound.. my heart stops, and I feel a roller coaster drop. Then, it's just an email from livingsocial talking about their deal of the week. UGH! I reallllly hope we hear back this week, since its my off week from work. I know I will cry like a baby when I see the admissions decision-- whether I get rejected and even more if accepted. I do not want to be in public for this! I received a financial aid packet to UCSF but no letter... This must be another UCSF technique to test how people respond to being under pressure. Needless to say my sleeping pattern and binge eating is not good for my health. Not sure why it's so surprising. As mentioned during the Interview Day welcome session, every applicant who is interviewed will receive a financial aid letter. Again, EVERY APPLICANT WHO IS INTERVIEWED WILL RECEIVE A FINANCIAL AID LETTER.